This Saturday, don’t miss UFC 183 as future Hall of Famer Anderson “The Spider” Silva returns to the Octagon to face Nick Diaz in the Super Fight main event. 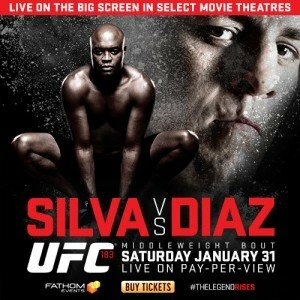 Order UFC 183: Silva vs Diaz – live on Pay-Per-View this Saturday at 10pm/9c or watch it live on the big screen at a theater near you! Go to fathomevents.com for participating theaters. Register below to WIN a pair of passes to the viewing party this Saturday!